Prominent & Leading Manufacturer from Ahmedabad, we offer pp hdpe pipe fitting. We have a vast experience in the domain of HDPE Pipe Fitting. 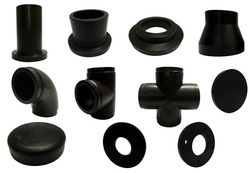 We offer our esteemed clients a broad gamut of PP HDPE Pipe Fitting that is made from the supreme-grade raw materials mixed with Carbon Black for U.V. resistant properties. We manufacture these fittings under the most stringent quality norms conforming to the international standards and by using cutting-edge technologies in our ultra-modern facilities. Our clients can avail these as per the site conditions at reasonable prices.